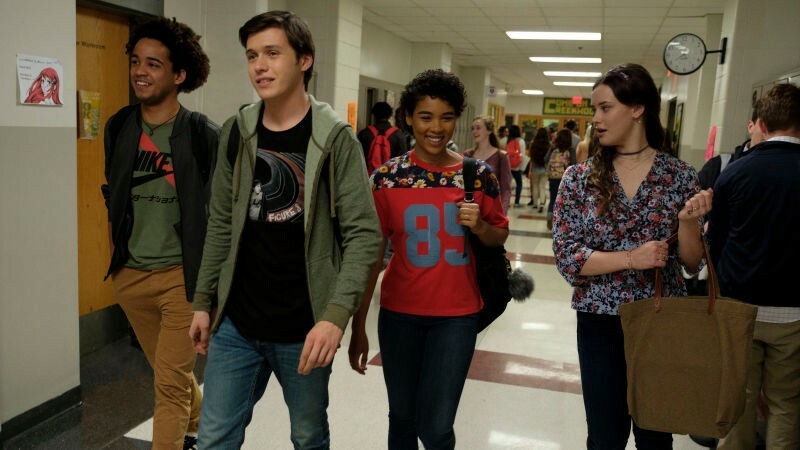 Love, Simon is your new favorite coming-of-age comedy. Humor, empathy, cringe-y awkwardness? All there. You’ll recognize its DNA as well. It features the quick wit of Ferris Bueller’s Day Off and Mean Girls. The hero has an identity crisis a la Cher Horowitz. There’s a Jake Ryan object of crush-y affection. And in the tradition of Say Anything and The Fault in Our Stars, a character performs a grand gesture in the name of love. Two gestures, actually. There’s just one difference. A remarkable one rarely seen in a slick mainstream movie. The thing is, Simon knows he’s gay. Probably ever since he swooned at the Daniel Radcliffe poster on his bedroom wall. Alas, he can’t say the words or even write them down — until an anonymous classmate on a popular school blog posts an open letter revealing that he, too, is struggling with this sexuality. While the students play guessing games, Simon sees it as an opportunity to share his secret. He creates a new email account and reaches out to the writer (known as “Blue”), signing it with the alias “Jacques.” Simon and Blue start as friendly pen pals and, soon, their communication develops into something richer and far more meaningful. The love is real, even though they don’t know each other’s real identities. Like any newfound teen relationship, it’s oh-so delicate. So when Simon is outed, the dynamic changes. The email letter-writing device is familiar yet shrewd. We all have secrets locked inside our mind and hearts that we would not dare speak aloud. The correspondence allows us to authentically see and hear Simon’s inner-monologue — should he come out? Will Blue ever reveal himself? — in a way that would seem hackneyed in open dialogue. And some of the smaller moments don’t need any further explanation at all. Sure, Simon’s parents are hard-core liberals. Yet every time Simon’s dad makes a subtle heterosexual crack, whether it’s about Gigi Hadid’s hotness or why the new Bachelor is clearly gay, we all feel Simon’s pain and understand why he’s so tentative to open up to them. Love, Simon, based on the 2015 novel Simon vs. the Homo Sapiens Agenda, is no treacly PSA. That’s a credit to Greg Berlanti, the veteran and openly gay TV showrunner who’s given us the flashy Arrow-verse, as well as the sincere family dramas such as Brothers & Sisters and Everwood (now streaming on Hulu!). He directs his film with genuine warmth that radiates off the screen. He knows how to evoke a well-earned emotional response. He knows family. He knows teenagers. I don’t think he needed to include the clichéd Halloween dance and Big Game Speech in such a well-oxygenated story, but there’s no doubt his heart is in the right place. Simon is a fully realized three-dimensional character, hilariously unsteady when he tries to flirt with a landscaper and a wreck when a friend gets wind of the email exchanges. How refreshing to see a teen boy on a big screen that’s not a sleepy-eyed, monosyllabic jerk just looking to get laid. There’s immense charm to Simon’s story, enabling us to root hard for him to get his happily ever after. He’s not just Woke, he’s fully awake. For all of Call Me By Your Name’s acclaim, I’m not convinced any real teenager — let alone any teen going through similar growing pains — actually saw the bittersweet and high-brow story of a young Elio falling hard for the confident grad student staying in his family’s Italian house for the summer. 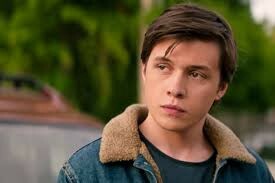 Love, Simon, however, is signed, sealed and delivered to the masses. KIT, OK?